weber_cam: 16" x 16" Slate to bake on? 16" x 16" Slate to bake on? 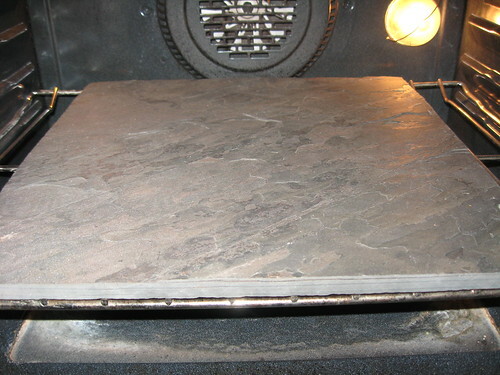 16" x 16" Slate to bake on?, originally uploaded by Seligmans Dog. Having destroyed all my terra cotta tiles over the years, I decided to try a slab of slate to cook on. It's an unfinished sample I got at Lowe's yesterday for $10. Currently taking it through temperature cycles to see if it holds up. So far, I can see the layers on the side slightly separating. If it gets to some static state, it should be fine. If it continues to separate, it's back to the terra cotta. Any updates on the slate? I did a couple more RT -> 500F cycles and it hasn't separated any more. I think I'm going to toss a loaf on there tonight or tomorrow. I've used slate tile for years, and with the same experience re: splitting. I've found that once it cracks a couple times, it's done. The only reason I've tossed them is cause I spilled a whole load of duck fat on some once, and once in there, it ain't comin' out. Thanks for the comment Kevin. I did a pizza on this last night and it was great. Uneventful. The image was blurry or I would've posted it. Nice surface though. I'm guessing most surfaces would retain duck fat forever. I bet it smelled good though. I tried a piece of slate once. It was good for about two months until it had absorbed enough splatter from pizzas and filled breads that it started to smoke and give everything an off flavor. Maybe it was the layers that let it hold on to so much. I went back to the hardware store and bought a whole box of 6X6 unglazed quarry tiles. I have enough to last me for years while still handing a couple out to friends. I clean them with baking soda and water and a stiff brush and never have any problems with them. Thanks for that. So far, I'm enjoying the slate, but won't use it again if it fails. Never thought of checking hardware store for the tiles. Thanks!